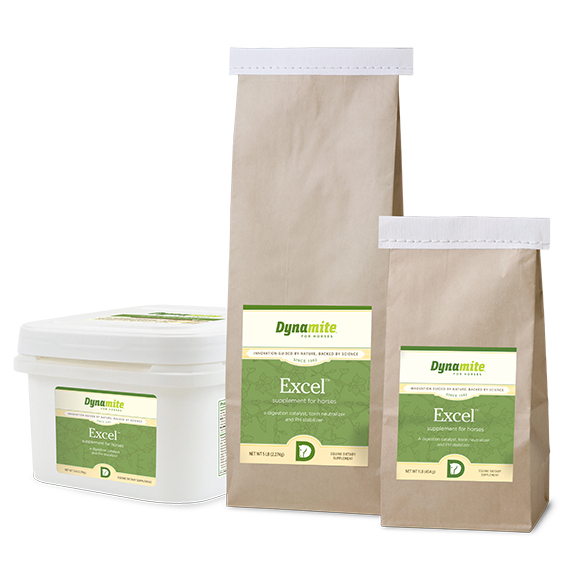 Excel is a digestion catalyst and pH stabilizer. It is intended to be used with a complete nutritional program that includes our Equine Foundation Program. Excel can be used as a top dressing or milled with the feed. The vegetarian formula includes Dyna Gold (listed as montmorillonite clay) from a mineral-rich deposit that is detoxifying while providing support to the digestive system. Remember, our products were created to be part of a complete Foundational Program. Before ordering adjunct products, be sure to check with your distributor or look on our blog at dynamitesblog.com to learn more about why our philosophy is less is more and the importance of the basics in our Equine Foundation Line.